After a few days in Athens, Jeff and I spent three days on the island of Aegina with Paraskevi, a friend of a friend, whose friend was a friend of our friend’s friend’s sister (which is how our friend met Paraskevi’s friend, who is now our friend. Somehow, this all makes perfect sense!). On Aegina, we spent three days laughing. Paraskevi is one of those people in whose presence everything becomes a source of hilarity—one of the reasons we are very happy to say that she is now our friend, too. She is a crazy in a lovely way, a painter of icons and an aficionado of the simple but wonderful. And, as we have now experienced so often in Greece, what hospitality she showed us—without knowing us, she took us in to her home, fed us, talked with us, and spent three days showing us around the island. Aegina is known as an important pilgrimage site for Orthodox Christians as it is where St. Nektarios, one of the most beloved modern saints, lived and eventually founded a convent (a group of women came to him, asked him to be their spiritual father, and then later formed a monastic community under his guidance). They are now finishing a cathedral in his name, built entirely on donations left from the sale of candles that people light in the chapels at the convent, which is an indication of the number of people that make a pilgrimage to this island. It is an island of nuns, with many convents scattered throughout. There’s a rumor that there is also small group of monks has recently settled somewhere on the island. This was relayed to us by Paraskevi, with some derision (everyone knows this island is for nuns!). 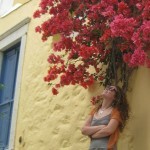 Thanks to Paraskevi, we managed to visit nearly every convent on the island. One of the last that we visited was my favorite, which also happened to be the favorite of St. Nektarios, named Holy Mary. There are very few nuns there now, and most of them old and hard of hearing, so they often don’t hear when a visitor knocks on their door for admittance. When we knocked, we heard a voice call out in Greek, “Push!” So we pushed, but the great door didn’t give. Paraskevi turned to us and explained—that voice must have been the parrot, who over the years has learned the nun’s usual response to a knock. We made a bit more racket, and eventually were let in, while the parrot jabbered commands, blessings and exclamations of spiritual devotion. At this convent, the nuns had many animals, mostly birds: dozens of canaries, the aforementioned African Grey, geese, ducks, and even three ostriches. We made a special visit to the ostriches and I was amazed to see them so close. They seemed similarly amazed to see us, as they followed us up and down the length of their fence, eying us and flapping their wings. Their big eyes, their cavernous throats that I could peer down as they panted—they seemed unreal to me. I could have looked at them all day. Speaking of deaf nuns, there is a similar situation at the convent built in honor of a hermit who came to Aegina and built a hut in the style of the caves of Cappadocia, from where he fled the Turks. He spent his life in his hut in prayer. There are also very few nuns at this monastery, all old and all a little deaf. The problem is compounded by the fact that, being old-calendarists and in many ways a little extreme, they refused to adopt the euro when it appeared in Greece, which they considered to be an ill-starred imposition of the West. What does this have to do with us getting in to the monastery? Well, without euros, it is difficult to keep and pay for electricity. So the nuns have been going without for some time now, and as a result, the buzzer isn’t as efficacious as it was in drachma days. Paraskevi was worried that they might not hear us knocking, and such was our luck—we knocked and knocked, with no response. Luck changes though, and we hadn’t been pounding on the door long before a man in a passing car noticed our distress. He leapt out of his car and immediately started pounding on the door and shouting his name: “Lefteris!” He cried. “Lefteris!” After a while, a nun peeked her head out of a another, adjacent door and indicated that she would let us in. We turned to Lefteris to thank him, and Paraskevi asked, jokingly, if we might use his name in the future should we ever need to get in to this monastery again. The man named Lefteris looked at her with the most wooden, bordering on sour expression. After some moments of this, without changing his expression and without any indication that he understood her tone, he said that, yes, he supposed that it would be fine for us to use his name. Greetings from the land of poetry, amazing food, and lovely goats! I have already embarked on my Greece adventure, and am trying my hand at learning a little Greek here on the island of Rhodes before heading off to the less-traveled parts of Crete. I will be spending the summer reading Homer’s epics alongside the poetry and prose of C. P. Cafavy and Georgios Seferis. It is an amazing opportunity to be able to read these poets’ works while immersing myself in the language and landscape that inspired them. For my final month in Greece, I am looking forward to an extended stay on the isle of Lesvos—known for being a particularly inspiring hangout of Aristotle and the birthplace of Sappho.